The week after my trip to Shiloh I rejoined my adventurous friend Adam for yet another adventure. 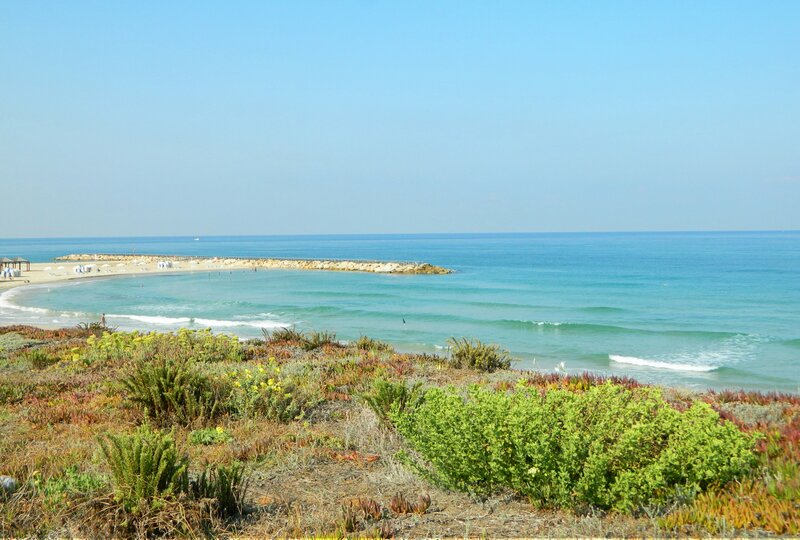 This time it was for some early morning birding and more along the coast just north of Tel Aviv. 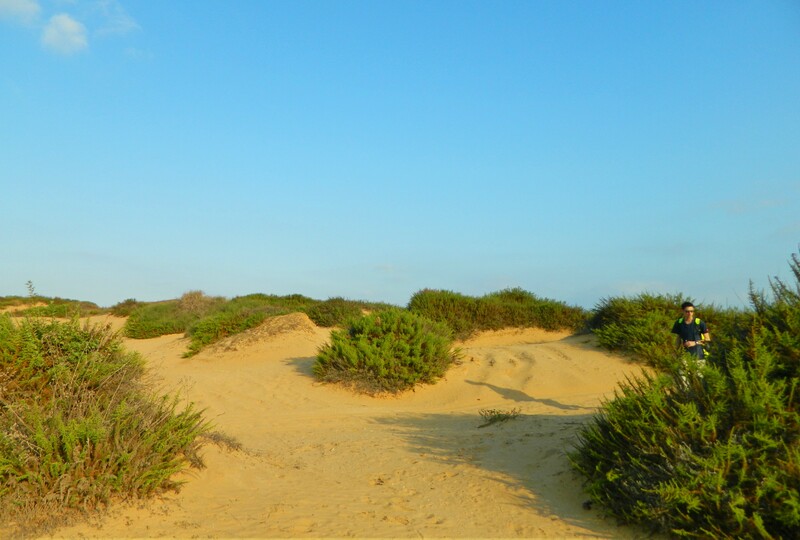 We took a very early bus because we wanted to be out in the dunes by the time the birds start to stir. With just a tiny busing miscalculation we reached the fields just inland from HaTzuk Beach, roughly halfway between Tel Aviv and Herzliya. 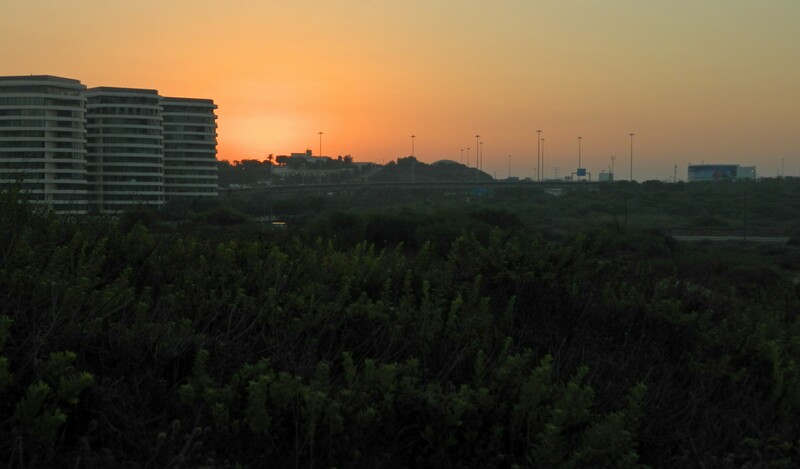 The sun was just peeking over the horizon as we entered the scrub fields, walking along sandy paths that crisscrossed the area. Almost immediately we had an incredible sighting. A quail burst up from underfoot as we stood scanning the vegetation, its characteristic flight giving away its identity as it disappeared rapidly. This was my first time seeing a quail in the wild, and it was something that has piqued my interest for a while now. In addition, a sparrowhawk was spotted flying high up near one of the several hotels in the area and shortly thereafter we started seeing shrikes, whinchats and wheatears flying from bush to bush, presenting themselves nicely in the early morning light. We continued walking south, passing through the vegetation in relative silence, keeping a keen eye for wildlife of all varieties. 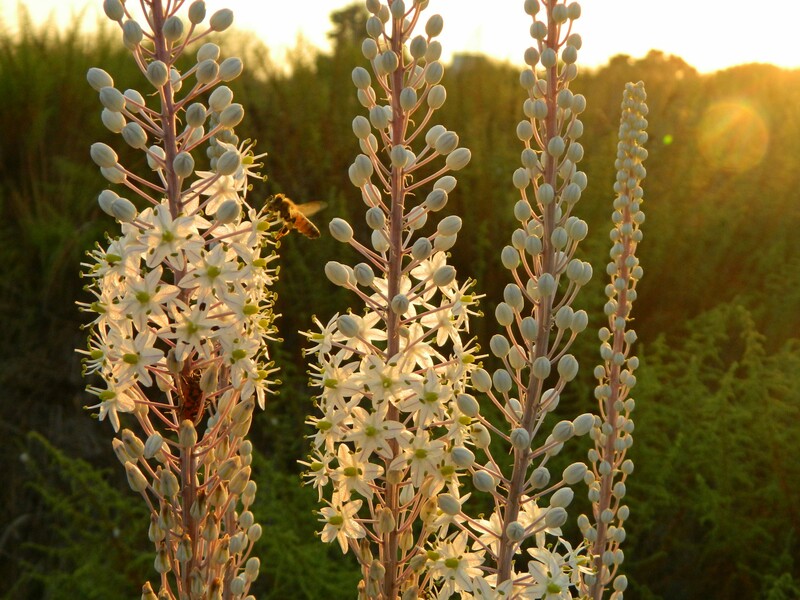 We came across some interesting plants as well, from the sea squill to the sea daffodil, and later, blooming beach evening primrose growing directly in the sand itself on the dunes. 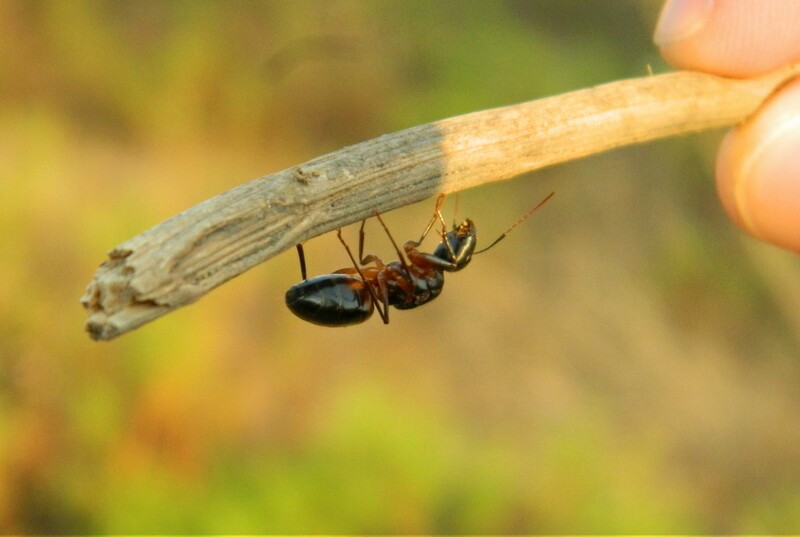 But it wasn’t just birds and flowers, Adam, more knowledgeable of bugs than I am, caught and showed me a queen ant that had lost her wings. There were also some antlion larva pits in the sand, dug to trip up unsuspecting walking insects on the loose grains. We pushed southward, the terrain becoming nicer and nicer as we walked, with songbirds showing themselves all over the place. Occasionally we’d take different parallel paths, scouring the land from two different angles. 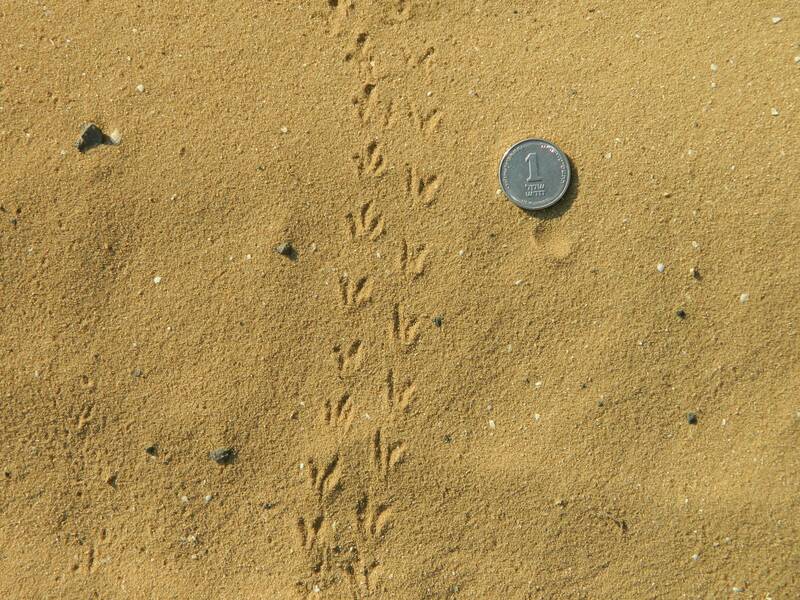 A hoopoe, our national bird, walked along several paces in front of me, poking around in the sand for insects to eat. Then, as we stood there, we spotted three bigger birds up in the sky coming in from the north. 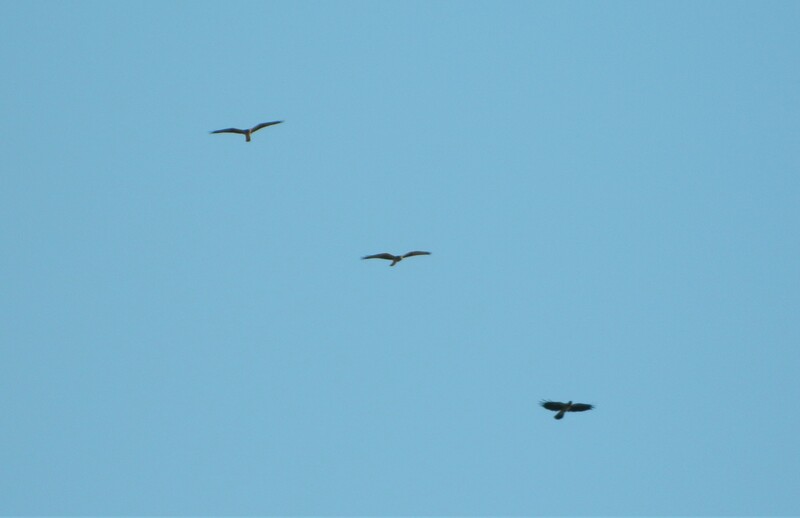 Activating my convenient 21x zoom, I was able to distinguish two birds of prey and a crow, the flagship mobbing bird, always annoying other species. Making note of the long and narrow wings, with the narrow tail, I knew we were looking at harriers even before they passed right over our heads. This was my first time seeing a Montagu’s harrier, and what a sighting! The “new bird” excitement carried over to the next cool sighting. A corncrake popped out of cover just in front of us, seeking refuge towards the sea. We attempted to follow it, to get a better sighting, but we were unable to relocate it and didn’t want to waste too much time poking about all willy-nilly. At this point the terrain was changing from the yellowish sandy flats to proper dunes with reddish sand, at times red clay loam. 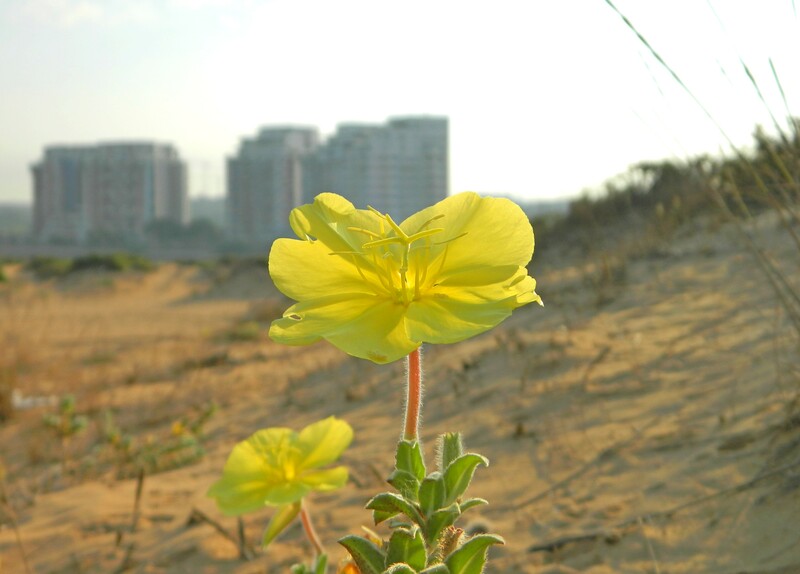 The vegetation became sparser, mostly short bushy plants and the aforementioned beach evening primrose. 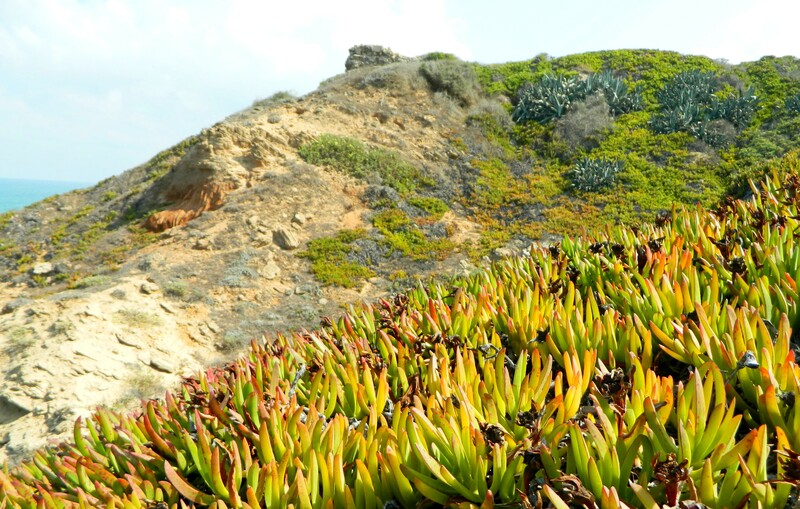 The contrast of the reddish sand, the green plants and the blue sky made a beautiful scene for our eyes to behold. Lots of tracks crisscrossed the sand, and we made our own tracks as we walked up the highest part of the dunes. We looked out over the Mediterranean Sea, taking in the views as we took out our breakfast. Eating as we kept an eye out for seabirds, we talked about how beautiful and remote this place was, even so close to such urban areas. To highlight the proximity, military aircrafts passed us both before and after breakfast: a C-130 Hercules cargo plane and a Blackhawk helicopter, both with camo paint-jobs. Just after breakfast, heading back down the dunes but still making our way southward, Adam spotted a common kestrel on a nearby clump of loam backdropped by the gentle waves. We watched it, taking pictures as we creeped forward. 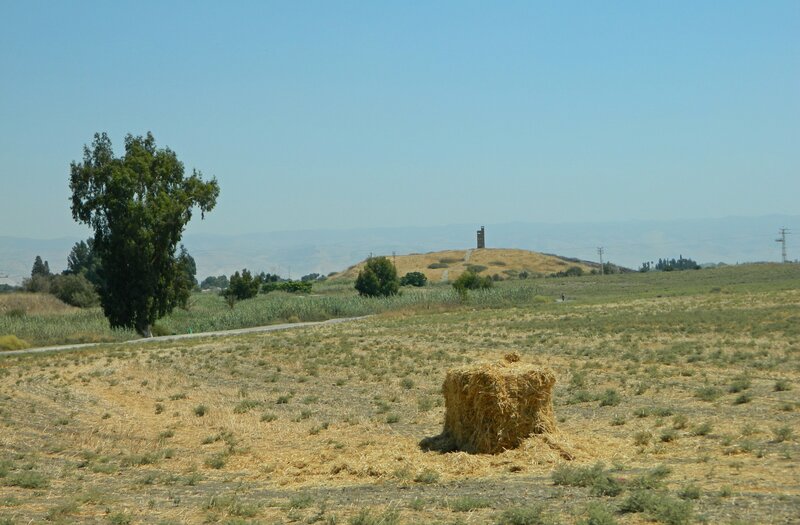 Unfortunately we ended up scaring it away but that gave us the opportunity to press onwards, heading towards an even taller hill: Tel el-Rekkeit. 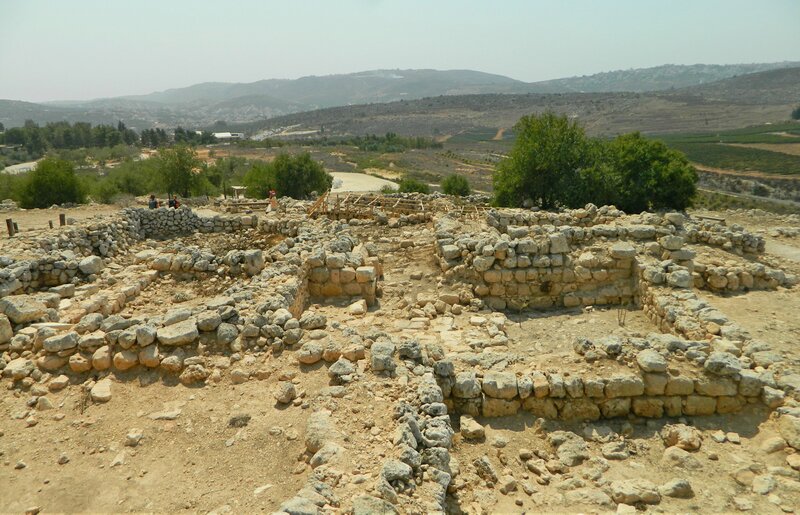 Crowned by an abandoned IDF military base, the tel once was the host of prehistoric settlement. Seemingly nobody bothered to use the hill until WWI when the Ottoman army established an artillery base to shell British troops approaching from the south. 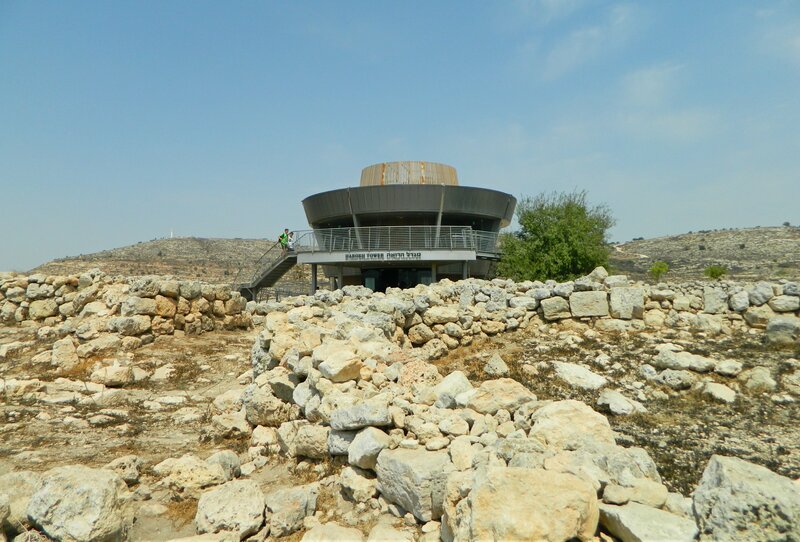 Once the Ottoman base was conquered, it was converted into a British base, and subsequently an Israeli base. We climbed the hill and looped around the western side of the base fence, arriving at the entrance with the access road. Finding the site to be completely abandoned we ventured in, wondering if we’d find drug addicts or something similarly unpleasant. We stepped gingerly over the large amounts of garbage and building supplies that covered the ground, including terracotta roof tiles imported from France. We poked our heads into the different buildings, not seeing anything interesting, until I heard rustling in the bushes up against the eastern fence. Motioning to Adam, I crept closer and spotted two foxes making a quick getaway through a gap in the foliage. There wasn’t much else to see within the base so we headed back out, attempting to find the old Arab graves that are on the eastern slope. Instead we found a tiny cliff which didn’t afford passage, and the decayed remains of a dog or jackal. We continued south along the dunes, seeing a lot of ice plants covering the sandy slopes, and some thorny bushes – the preferred hangouts for shrikes. One beautiful red-backed shrike, singing from his perch on the thorns, posed for me quite close by. It was a lovely experience, and I was sad to see him fly off. Shortly thereafter, on the final stretch of the dunes area I found a ₪10 coin (worth $2.85 USD at the current exchange rate), and then we made our way down to the Tel Baruch beach. Having planned for this, we packed swimwear and towels and changed into our beach garb. We headed for end of the tiny artificial bay, up against the rocks of the breakers, and entered the warm waters. Nearly immediately I felt sharp little bites on my feet and remembered hearing about the sargo fish who have been a bit of a terror to beachgoers this summer. 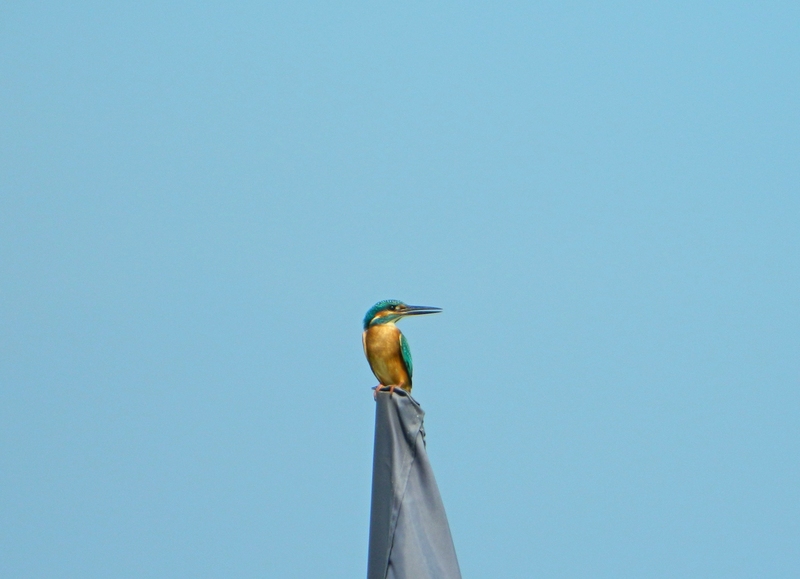 Then, I realised that a common kingfisher was perched on a pole right in front of me, watching the water for small fish to nab for lunch. Thankfully Adam brought his mask with him and we took turns peering into the underwater world, admiring the sargos and other little fish swimming around us in the shallows. 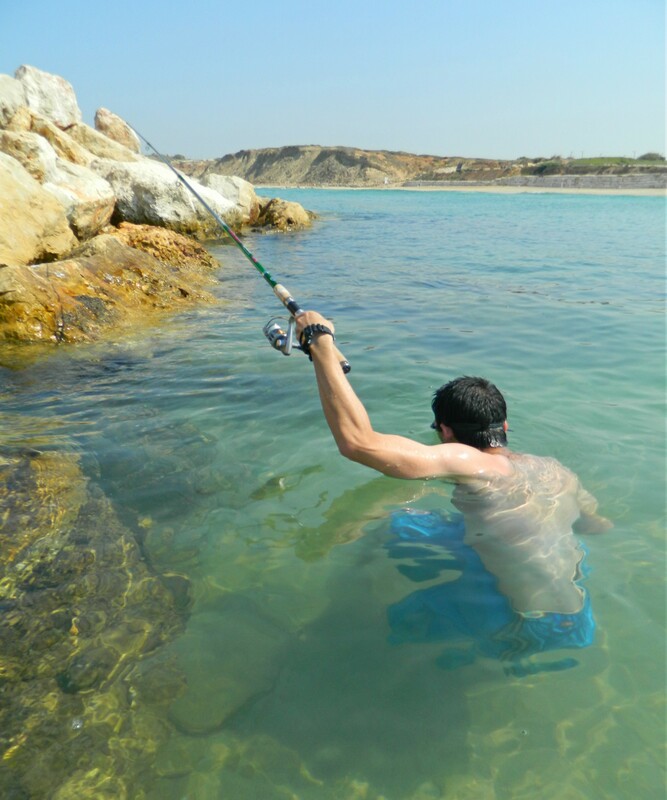 Having brought his fishing rod, Adam was looking forward to fish and so we also scrounged around for some “natural” bait, namely little crabs and limpets which we harvested from the rocks. Factoring in the mask, we decided to try fishing from within the water, head underwater to see where to dangle the hook. Unfortunately, we didn’t have much success. Well, no success at all. We left the water to try fishing from the breakers and had a continued lack of success. When returning to the water, I noticed that there was a large area that seemed darker than normal. Getting a little closer, wading my way in, I realised that a huge school of sardines came by to visit us. We spent the next while swimming within the school of sardines, marveling at the up-close experience as we watched them underwater with the aid of the mask. At one point, I was underwater and the aforementioned kingfisher plunged into the water less than a metre in front me, but sadly I missed seeing it due to the fishy distractions all around me. Hours passed with us playing around in the water, exploring the sandy seafloor and identifying several types of different fish species, including a type of blenny. At last I remembered that I had to be back in Givat Shmuel later that afternoon and we packed up and left, heading the long way back via the bike trail that runs along Sde Dov Airport. We reached the Reading power plant at the Yarkon River and grabbed a bus back home, bringing an end to a very adventurous day. In the middle of September I took part in a nice day trip as part of my job at the high school where I work. 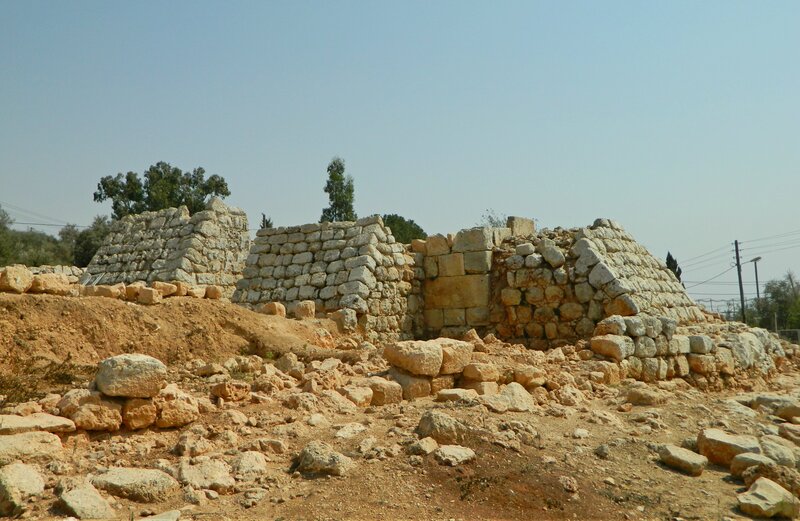 The class I was accompanying was headed for Shiloh, a site I had yet to visit, the longtime resting place of the Jewish Mishkan (Tabernacle), the temporary Temple, in biblical times. 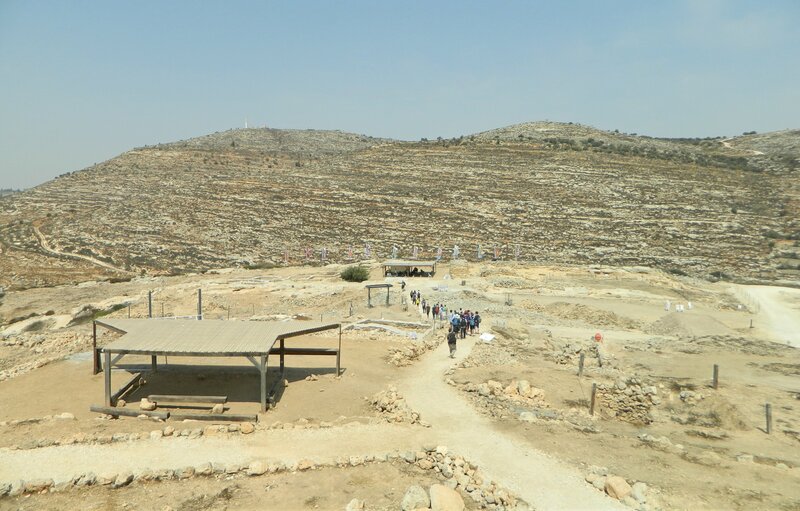 Ready for adventure, we boarded our armoured bus to be driven to Shiloh, located in the Shomron, south of Tapuah Junction on Road 60. 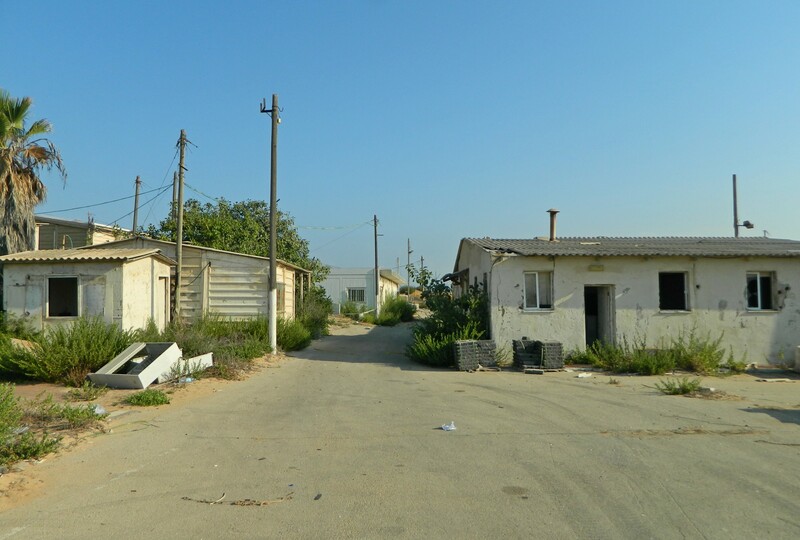 As I was passing my old army-time stomping grounds, I enjoyed driving through the Shomron and seeing the daily life just as I had left it years ago. We reached Shiloh and pulled into the small parking lot, disembarking beside a seemingly religiously-oriented Byzantine structure named the Dome of the Divine Presence. Its sloping walls made it quite curious looking, but there was little time for examination as I had school lads to tend to. 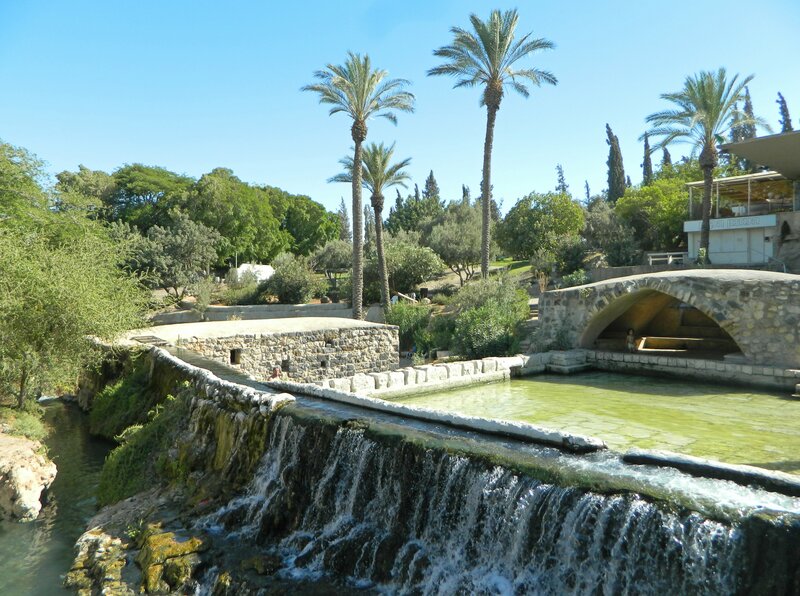 We gathered within the park, gazing down at a Byzantine reservoir and well, which was once outside a Crusader church, of which there are no remnants. Inside, past the gift shop, we broke into class groups with our own tour guides – ours was Eli Riskin, who exuberantly led us onto the first of the sites that we’d be seeing during our Shiloh trip. The first site was the reconstructed Byzantine basilica, a rough concrete structure built by a Danish archaeological team sometime between 1926 and 1932. 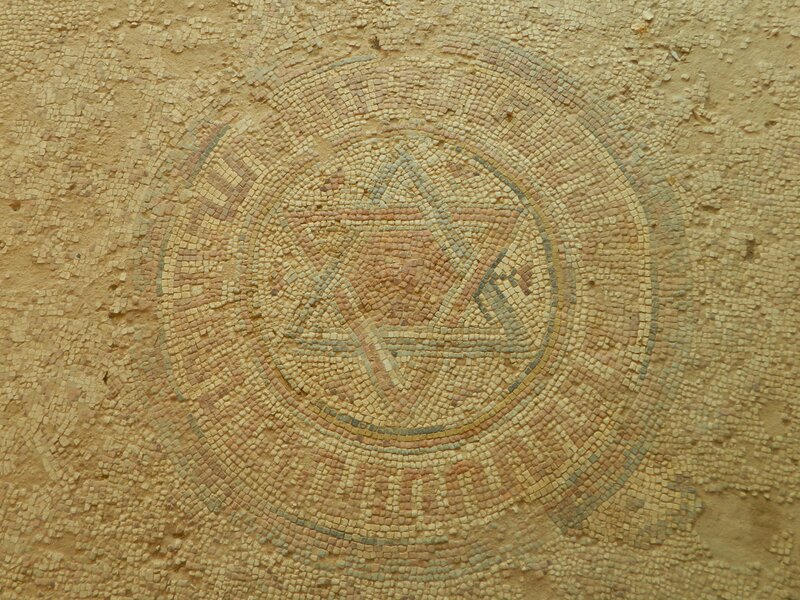 What they were sheltering was an expansive mosaic floor with various designs and motifs, the two most interesting being a Star of David and an inscription in Greek by the doorstep which helped positively identify this site with biblical Shiloh. Dillydallying a bit with my camera trying to get nice shots of the mosaics and ruins, I became separated from my group and continued on past a Mamluk mosque, also decorated with mosaic floors from the Byzantine era. 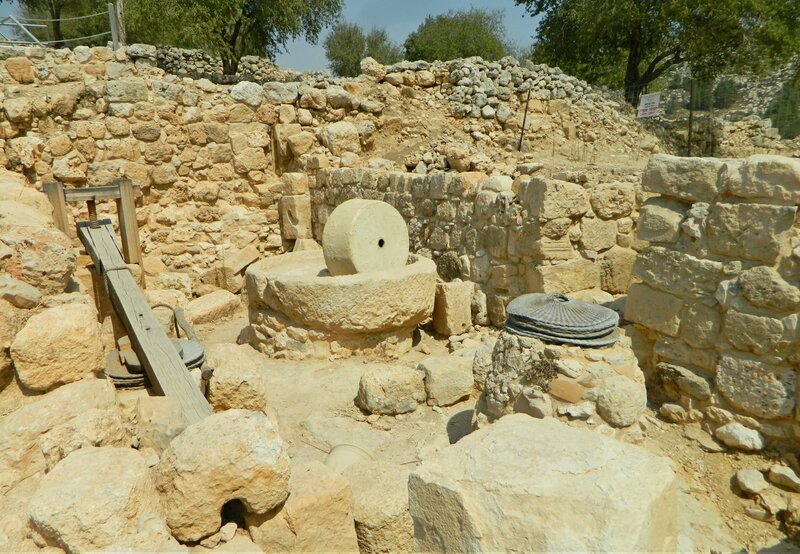 A piece of a horned altar from the Second Temple period was found here, fueling the fervor surrounding the site’s religious importance. 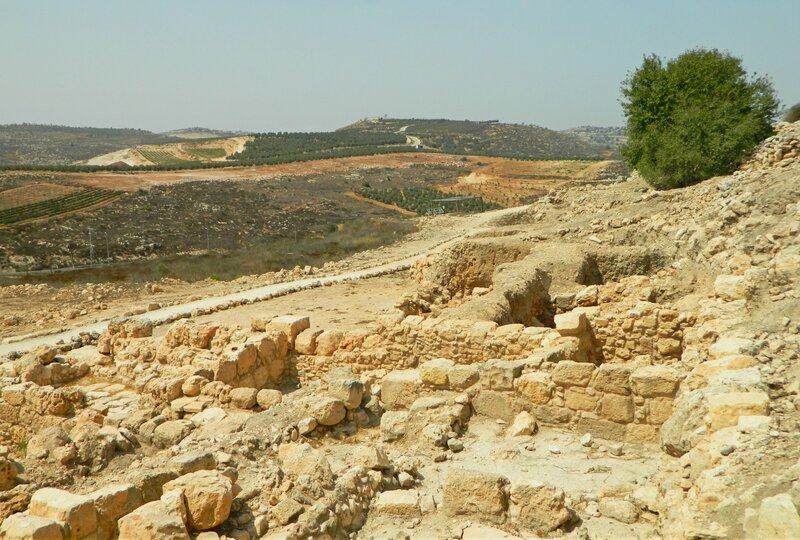 From there I began the climb up the hill, Tel Shiloh, with the ruins of the ancient city exposed all around me. I kept walking uphill heading for HaRoeh Tower, the visitors centre where the lads had congregated. Along the way, at the lookout, I admired modern-day Shiloh and the glimpse of the Tabernacle Memorial synagogue, built to replicate the ancient Tabernacle at least from an architectural standpoint. The school lads were watching a short film about Shiloh from a biblical perspective so I took the opportunity to visit the tiny museum by my lonesome. Exhibiting artefacts in a circular fashion in accordance with their timeframe, the museum houses some nice ancient vessels, weapons and coins. At last we went down to the area that is believed to be the site of the Mishkan, based on geographic and topographic calculations. We passed the wall of the original Canaanite city and reached a flat area where the bedrock was hewn in sections. Sitting beneath a shade booth we listened to the tour guides as they explained the site to us, followed by praying Mincha. Having reached the end of the park we made our way back, taking the scenic route around the western edge of the original city. Back at the entrance I checked out the Roman winepress installation and the hewn-rock graves, dated to the Second Temple period. After lunch of deli sandwiches we made our way to the buses, which afforded me a quick peek at the aforementioned Dome of the Divine Presence structure, and we were driven just across the road. 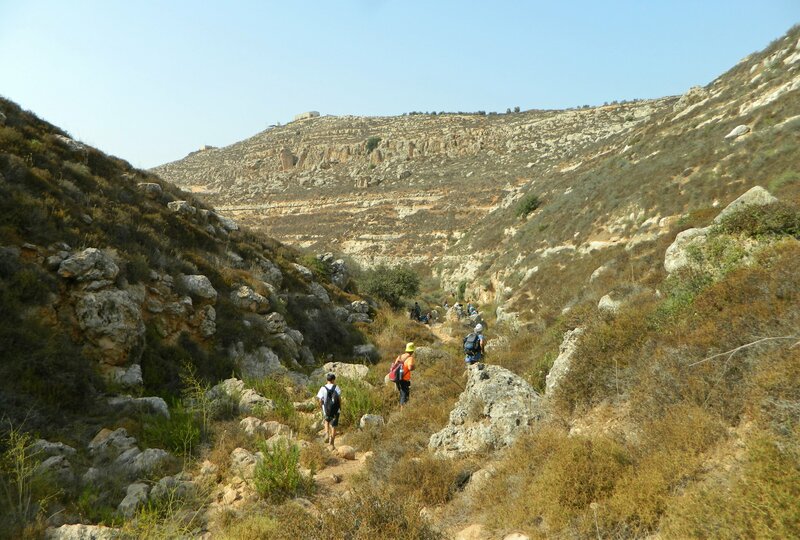 Disembarking, we took a nice hike along Nachal Shiloh, just about four kilometres of classic wadi hiking. 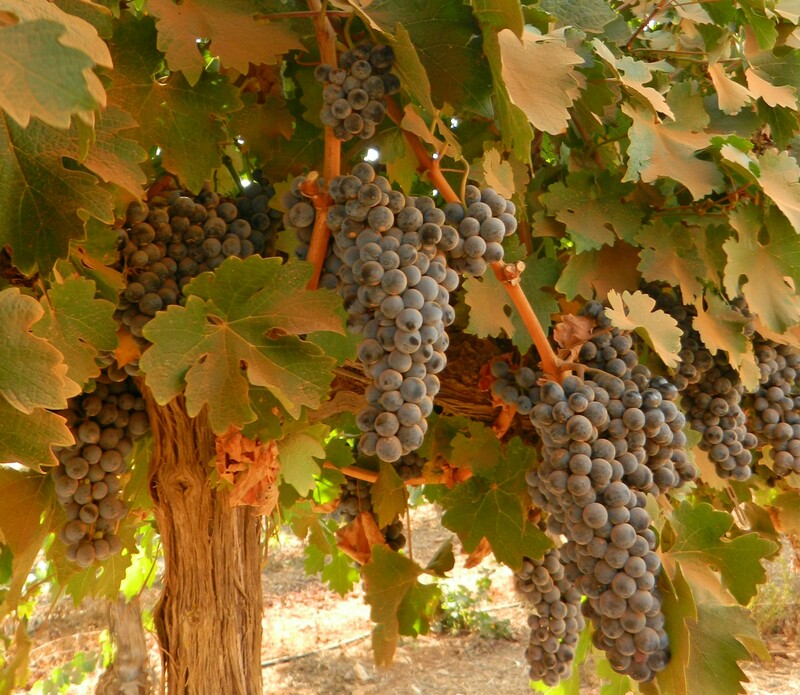 At first we passed the Shapiro Family Vineyards of lush, albeit dusty, grapes just waiting to be made into boutique wine. When we dipped down to the trail along the dry streambed, we followed our nimble guides as we traversed the rocks. Along the way I stopped here and there to see if I could find any cool wildlife. At one point, fast movement along the top of the ridge gave away two mountain gazelles which I barely caught with my camera. 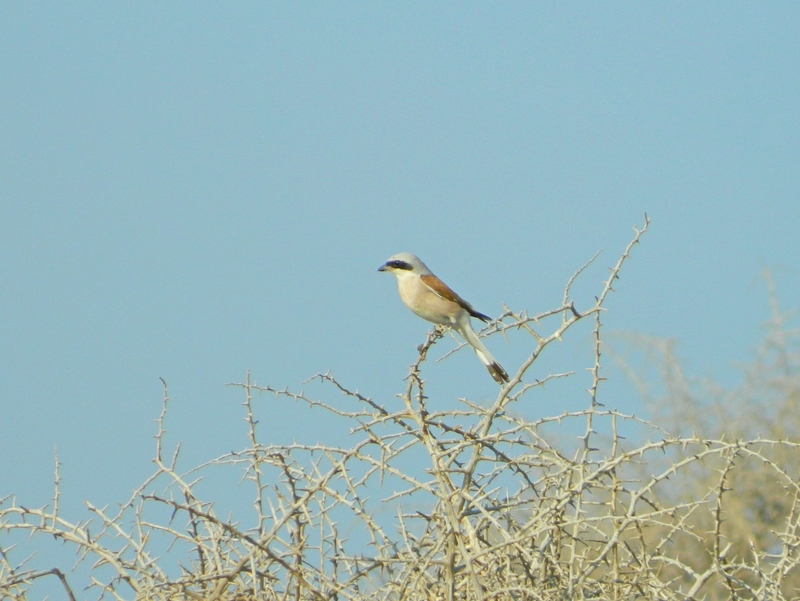 Later, I found some nice birds, namely a few blue rock thrushes and my very first red-backed shrike. Unfortunately, the spring we were headed to turned out to be quite choked by algae so we kept onwards, re-emerging at the end of the trail where the buses were waiting for us. Upon returning to Givat Shmuel, I met up with my frequent travelmate Adam for a evening out to the Dancing Camel brewery for the annual release party of the acclaimed Doc’s Green Leaf Party IPA, the highest rated Israeli beer according to voters on RateBeer. So ended another successful adventure. 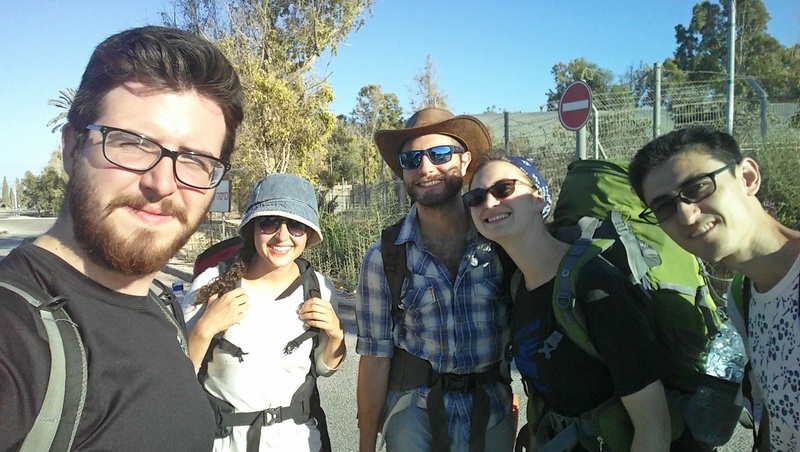 Having left Sachne in the previous post, our merry band of explorers – Ben, Miriam, Eve and myself – entered Park HaMaayanot to find the campsite that had been decided upon after consulting a satellite image map. We were looking for a scenic site, hopefully devoid of other campers and close to water. I had plans for some early morning birding, and the fish pools just 400 metres away seemed like the perfect place to accomplish this. 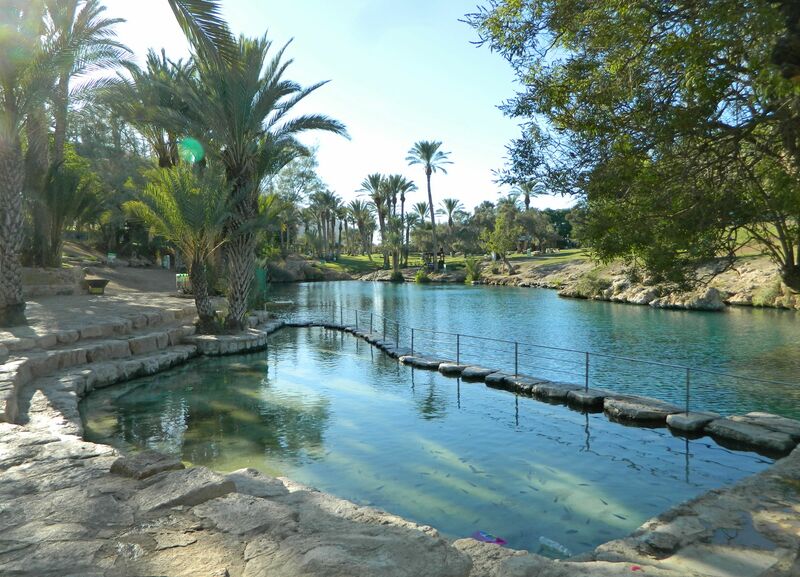 We followed the road through the park and arrived at the Ein Shokek, a picturesque little spring pool but, because we saw other visitors, we kept moving. 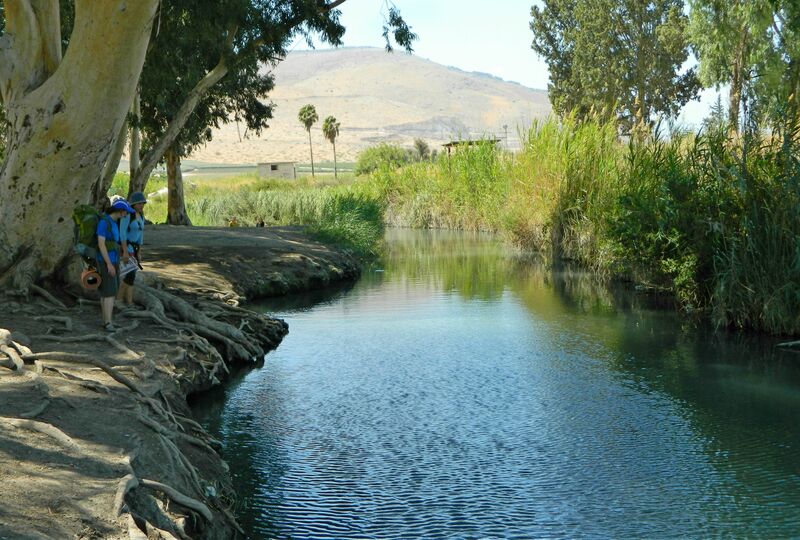 We walked along the tiny stream that flows from Ein Shokek, overgrown with reeds, and found the place at which we had intended to camp – and it was as beautiful as we had hoped. A shallow pool lined with rocks and shaded by eucalyptus trees, with ruins of an old flour mill and aqueduct on the side. To maintain privacy and seclusion we decided to camp on the other side of the flour mill and found a perfect place to pitch our tents. Sunset was imminent, the sun sinking behind Mount Gilboa to the west, so we finished up the preparations that required light. With the failing light came the jackals, and we watched as they came over in small groups of two or three, spying on us from a safe distance. As interesting as jackals are, we were getting peckish and had to figure out dinner from our dwindling stock of food supplies. 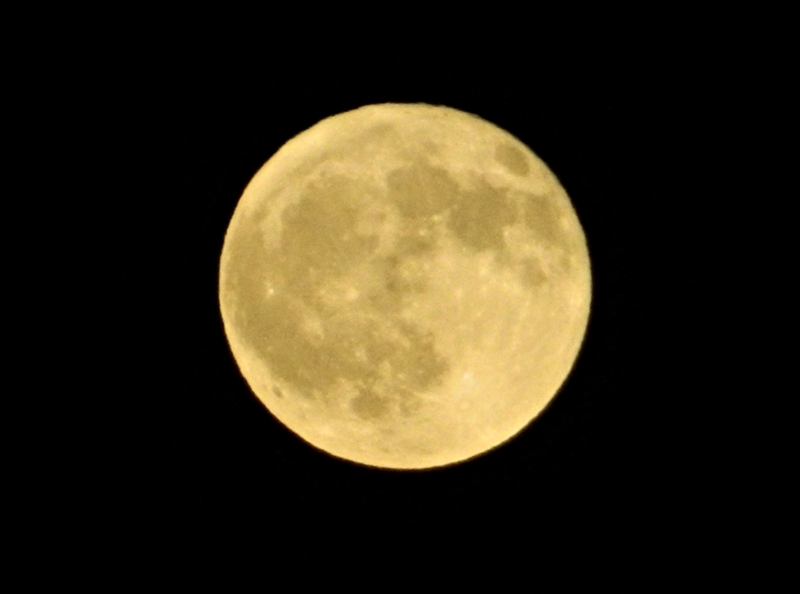 We had dinner at the picnic benches near the calm pool, the full moon wowing us with its splendor. 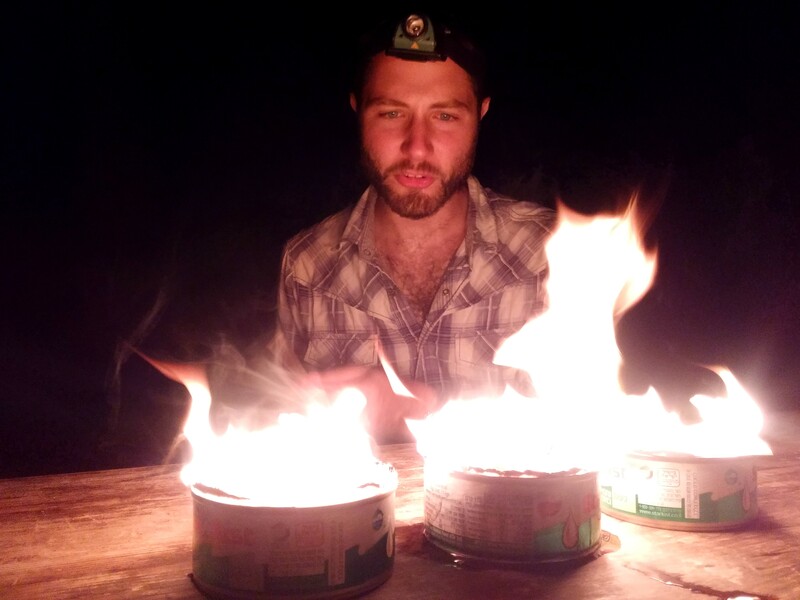 Not one for canned tuna, I decided that I would go ahead and try the classic Israeli scorched tuna method (see HERE). We sat in relative darkness, watching the cans of tuna burn brightly before us, occasionally spraying us with boiling hot oil and burning ash. In jolly good moods, we joked about the jackals coming for our food in the night, and that even if we’d tie the food up in a tree, the jackal pack would come and chew the tree down. This silly thought spawned the clever term “lumberjackal” which I must accredit to Ben. Next, Eve entertained us with a brief shadow puppet show on the trunk of a nearby eucalyptus, and when the tuna was properly scorched, we had dinner and a cup of lemon ginger tea. Going to sleep nice and early, the jackals didn’t interfere too much with our human encampment, nor did they turn into lumberjackals. I woke up at 5:30am to see my birding wish come true, and walked over to the fish ponds. I didn’t find anything too noteworthy at the fish ponds except for my first common sandpiper, which bobbed up and down among the waterside rocks. In addition, there was the standard stock of waterfowl such as egrets, herons and ducks as well as a nice amount of white-breasted kingfishers and barn swallows. 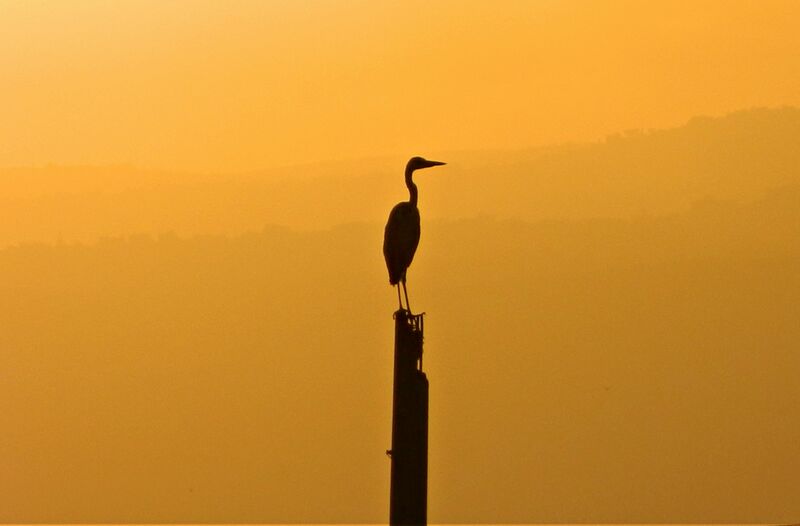 However, the views with the early morning sun were stunning, and the area just begged to be photographed. 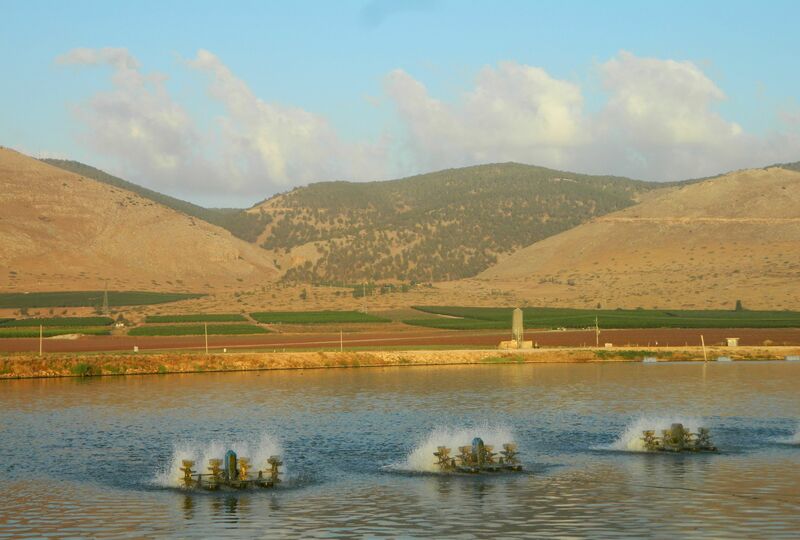 One angle that I found particularly eye-pleasing is the view of Mount Gilboa with the fish ponds in the foreground. I spent about an hour and a half at the ponds before heading back to my fellow campers, who were in the process of packing up their tents. With everything packed away nicely, we prayed alongside the eucalyptus trees and then I dipped into the shallow pond, enjoying a little foot grooming from the doctor fish and the suspicious glances of a lone catfish skulking about underfoot. 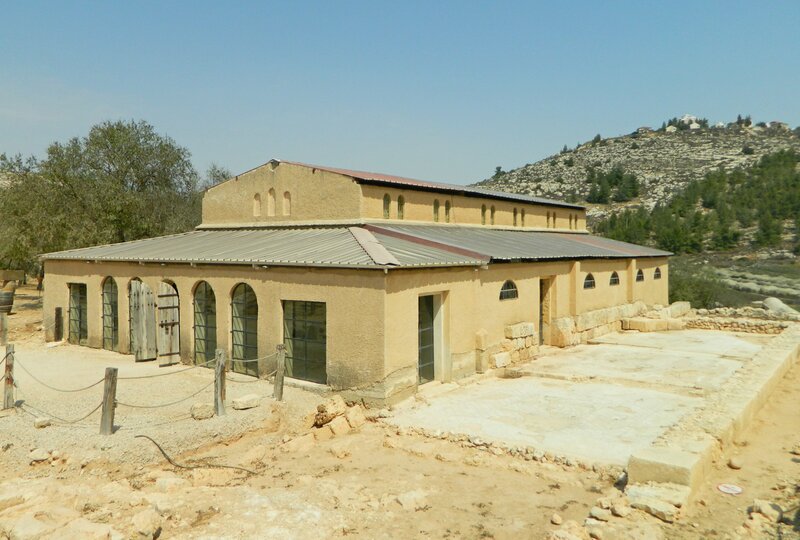 At last we moved on over to Ein Shokek and were thrilled at the simple beauty of the place. Perfectly clear water, with different shades of rock colours decorating the floor, and the presence of so many peaceful-looking fish made us want to stay forever. We entered the water in our swimwear, giggling at the gentle persistence of the hungry doctor fish, and splashed around in the warming waters. We were alone, but not for long, as small groups of visitors came by for mere minutes at a time. We had breakfast and tea and then made a plan for the rest of the day, eventually changing back into regular clothing. Getting golf cart rides back to the entrance of the park we set off on our short hike. 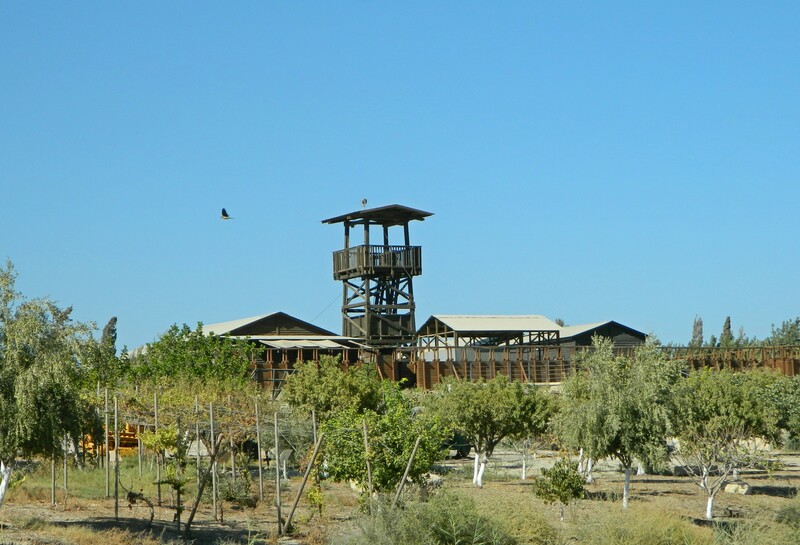 Crossing the park from west to east, we walked the trail along Nahal HaKibbutzim, passing some wildflowers and a few birds, including my first marsh harrier. It was a nice gentle walk, the golden hill of Tel Socha serving as a beacon up ahead. 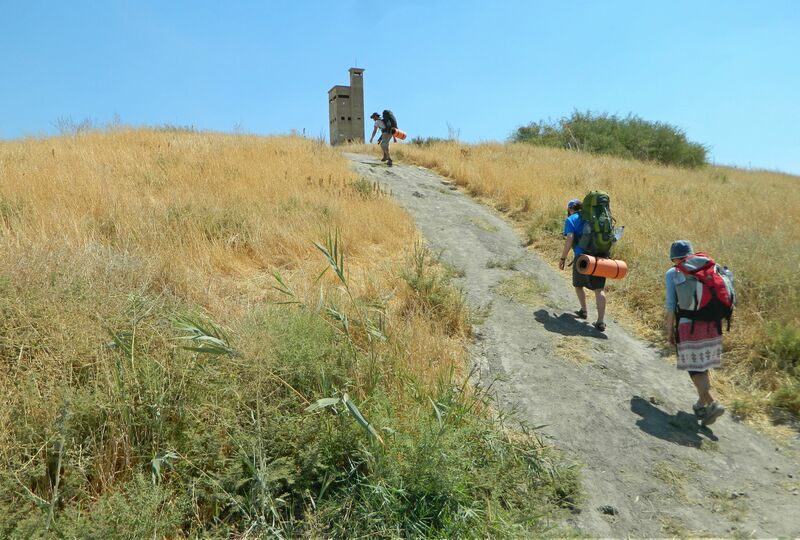 Climbing the steep hill, which has yet to be excavated despite signs of human settlements thousands of years prior, we reached the ruined watchtower. 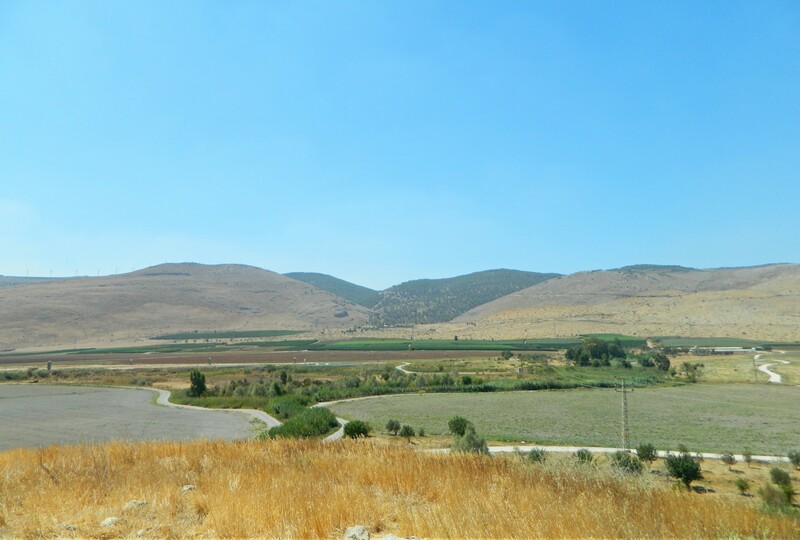 A few years after neighbouring Nir David was constructed, several kibbutz members were killed by local Arabs at the foot of this hill. So, to protect against further attacks, a watchtower was erected, named after the three who had fallen the year before. This story is where the alternate name of Sachne, Gan HaShlosha, comes from. 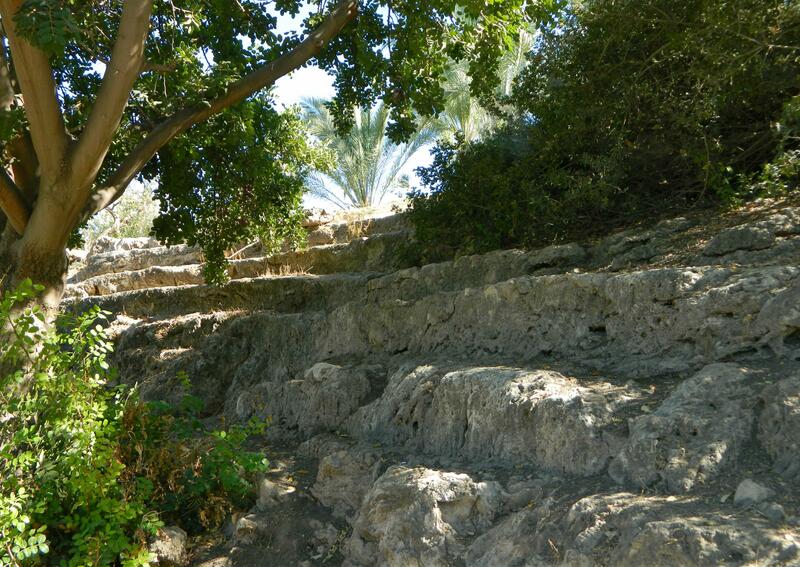 Hiking back down the hill, we spent a few minutes at the water of Nahal HaKibbutzim before heading for the bus stop a few minutes away. 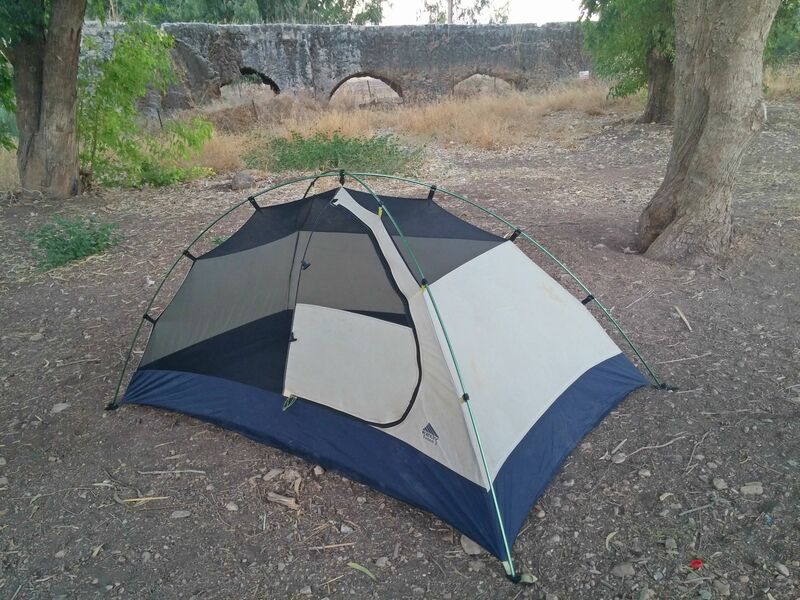 We were taken to the Bet Shean train station, and from there back to Tel Aviv, bringing an end to a lovely little camping trip with my adventurous friends. After two weeks of not doing anything fun save studying and taking finals, I participated in a trip that was mostly planned by my friends. Ben and Miriam, friends of mine, came back from a trip up north with convincing words that we all need to go visit Sachne. 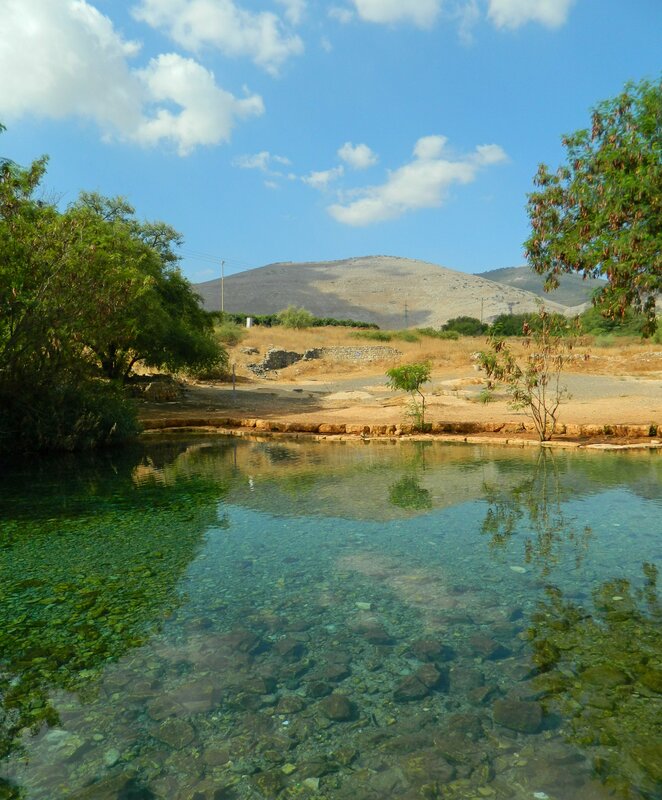 Also known as Gan HaShlosha, Sachne is a national park between Beit Alpha and Bet Shean in the valley below Mount Gilboa which largely focuses on a large series of freshwater pools stemming from underground springs. It has been described as “heaven on earth” and we were excited to explore it. 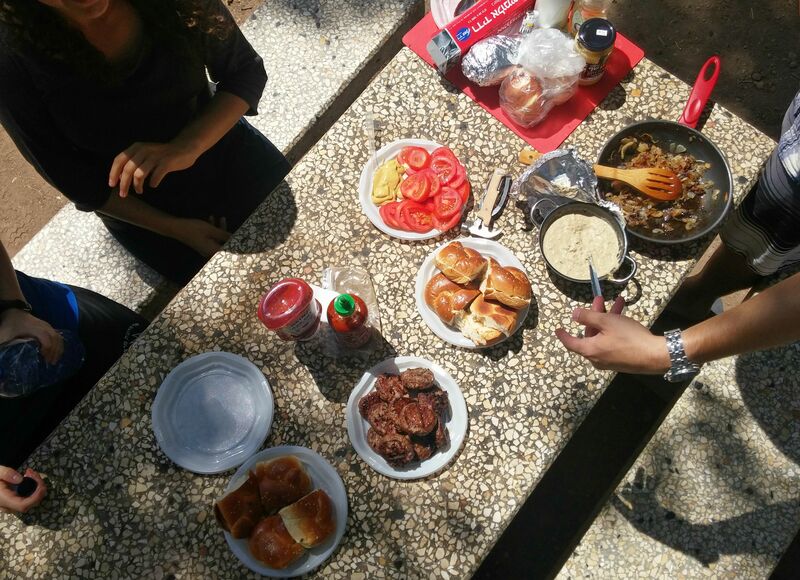 To make our trip as rewarding as possible, it was decided that we’d have a barbecue lunch at Sachne, spending as long as we could before the park rangers kick us out. Once banished, we’d go camp somewhere nice where we’d see water and the migratory birds that had just started to make their way to Africa from Europe and Northern Asia and then return sometime in the afternoon. I borrowed a tent from a friend and brought along the necessary equipment and supplies to ensure a glorious trip. Setting out for the 6am train, we were a snazzy party of five: Ben, Miriam, Adam (who is frequently featured), Eve and myself. When we passed the salt pools of Atlit I was surprised to see two flocks of flamingos standing in the shallow waters. I called out and gestured for my trip-mates to share in the joy of seeing some eighty flamingos relatively close by. For the amateur birder that I am, the trip was off to a great start and I was eager to see more. I was treated to a nice sighting of a short-toed eagle flying past the train near Mount Carmel. It was my first time riding the new train line from Haifa to Bet Shean, a reconstruction of the old Ottoman line that connected to the Hedjaz Railway. We arrived at Bet Shean and, after a very long wait for a bus, eventually made it to the entrance of Sachne. We paid the entry fee and entered the park, excited to see what the fuss was all about. 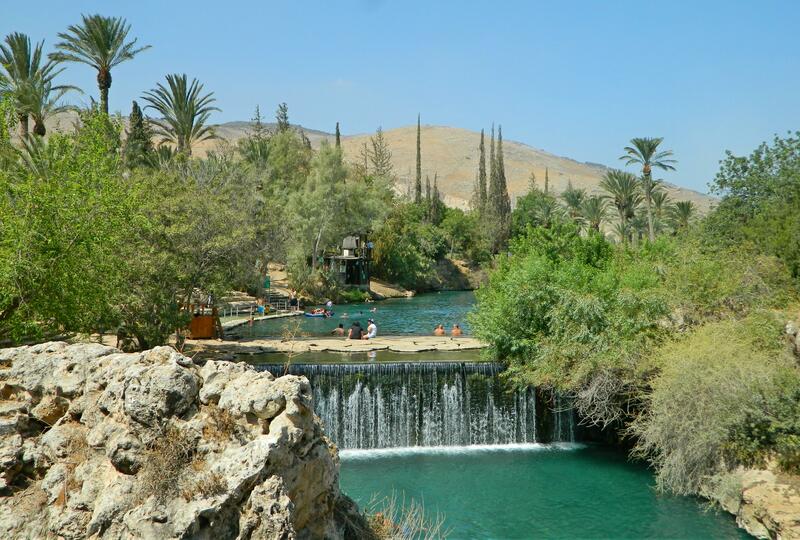 Because the park is long and narrow, along the lush banks of the Amal stream, Ben and Miriam took us to the southern side and together we searched for the perfect spot to claim. We found it just after the first waterfall, a picnic table beside a grill under the shade of some fig trees. Dumping all of our heavy bags at the base of one of the trees, we unpacked the necessary tools to get our barbecue going. I volunteered to stay behind and watch over our belongings whilst tending to the fire while the others went for a dip in the cerulean waters. I grilled up an eggplant and a pan of onions for the burgers we were to make next. The others came back from swimming and we continued cooking up a little feast for ourselves. We sat at the picnic table and dined, eating until we could no more. When the meal was over, and after our brief interactions with a large group of Bahais that were feasting nearby, we returned our focus to the beautiful water. It was my turn to explore and I did just that. Walking along the paved banks, we came upon something very interesting, something I had never even heard of. Hewn in the stone are the remnants of a Roman naumachia, stepped rows of seating for spectators to watch watersports (at least that’s what the running theory is). It must have been quite entertaining to sit on the stone steps whilst munching on some dulciaria procured from the passing usher. Those who find interest in dulciaria and other Roman foods should peruse the translated version of Apicius, a delightful Roman cookbook which can be found HERE. Continuing further along, we reached the old flour mill and the complex of pools, channels and structures which charmed us. We worked our way down to a particularly interesting spot where water rushes from two arched holes in a dam, spilling over a small waterfall at the end. 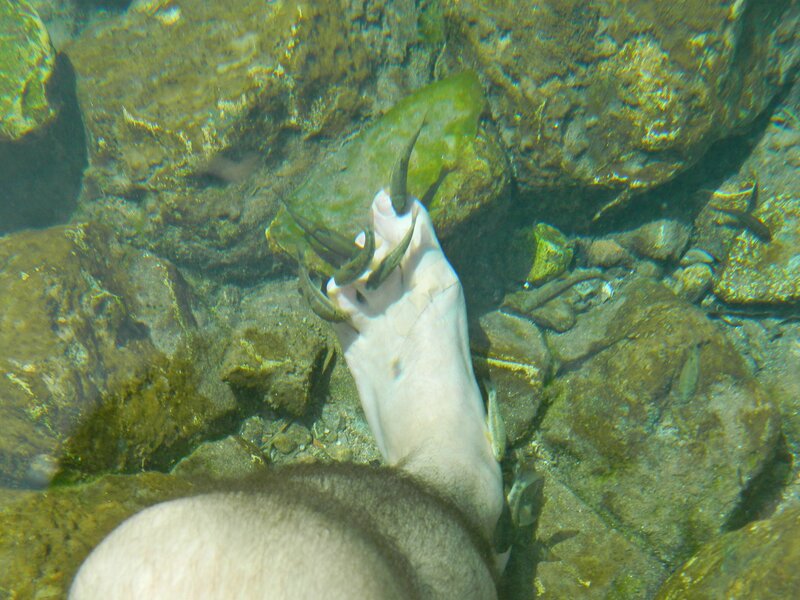 Doctor fish greeted us, sucking and nibbling on our feet as we traversed the rocky streambed. Donning goggles we were able to get a nice view of the underwater world, as shallow and fast moving as it was. I found great joy in sitting beneath the gushing water in the dam and then being swept along at the mini-waterfall. We went down to the pool below and found that the stream continued thenceforth rather peacefully, with some lazy fish swimming about in the greenish water. Returning to dry land, I went off on a quick scouting expedition to see what and where the purported archaeology museum and tower and stockade site. More about the tower and stockade building approach that was popular by necessity in the 1930s can be found on my post about the Old Northern Road, but what’s extra interesting is that the one at Sachne was the second of its kind to be built, preceded only by Kfar Hittim three days prior. I found the museum to be closed for the day and didn’t venture over to the tower and stockade, returning to my friends cavorting in the picturesque waters. Taking up the goggles once again I too enjoyed the water, noticing a common kingfisher perched on a root protruding from the steep banks just below our barbecue encampment. 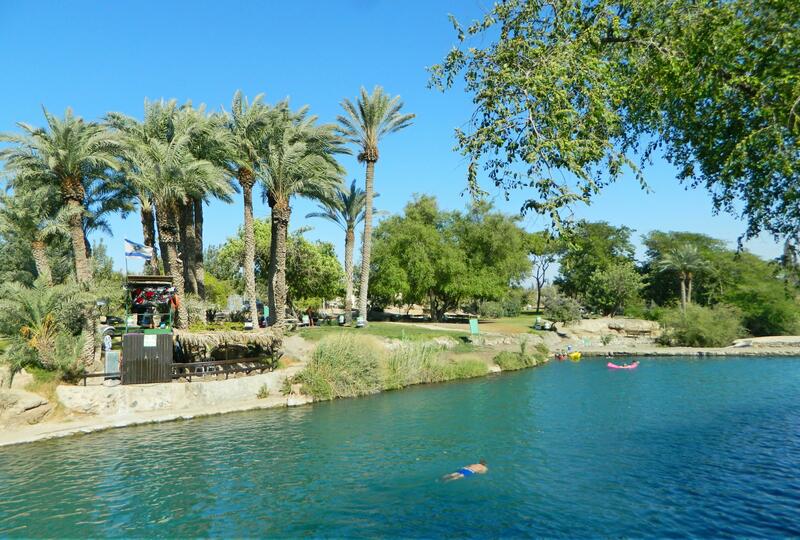 Swimming here and there, we were eventually called from the water as the park was closing. With great sorrow we dried off and changed back to our normal clothing. Adam was leaving us to get back to the Tel Aviv area while the rest of us were just relocating. 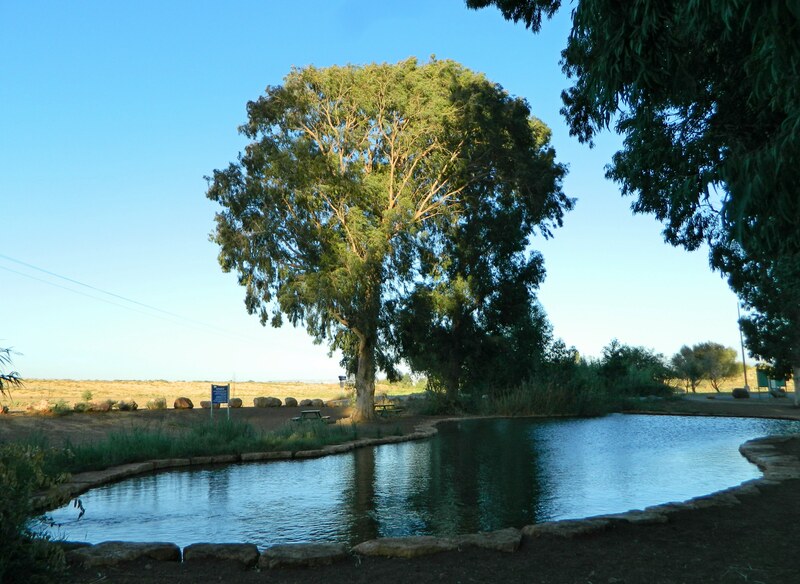 We left Sachne and headed to Park HaMaayanot (or, Park of the Springs) to camp beside a lovely pool amongst some eucalyptus trees – a site we found using the satellite map of Amud Anan, my favourite site/app for maps. The continuation of the day’s adventure will continue in the next post. 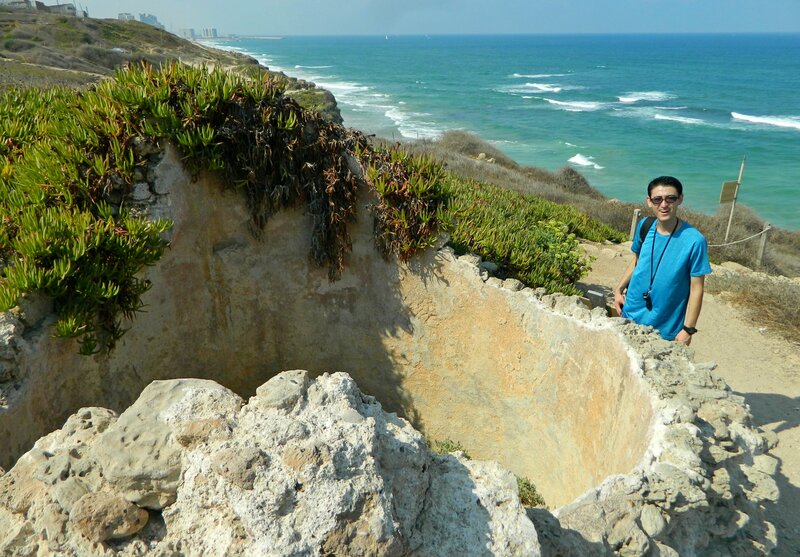 A week after I finished volunteering at the Horvat Midras archaeological dig, where I participated in clearing Israel’s only pyramid, I took a fun trip with my friend Adam. 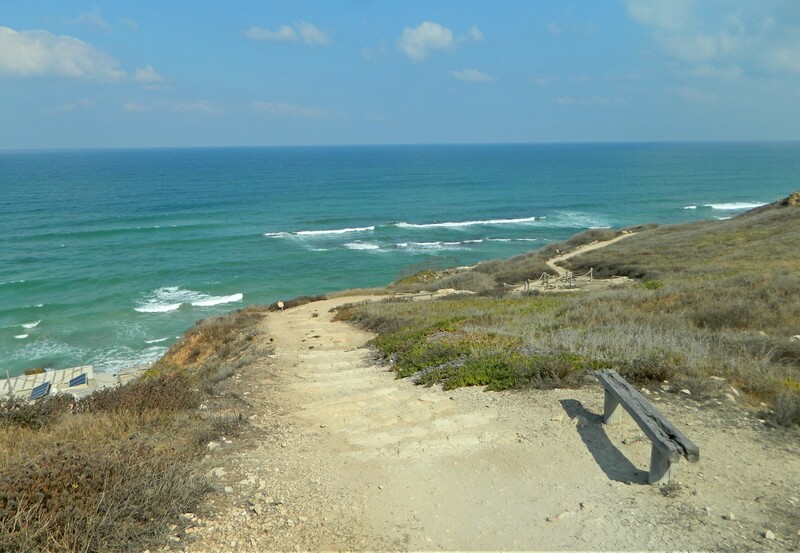 In the morning we headed to a coastal Crusader castle Apollonia (or Arsuf) at the northern end of Herzliya, busing our way via Tel Aviv. We made our way to the park after disembarking a few blocks away, noticing a large piece of glass laying on display at the entrance, testimony of Apollonia’s ancient glass industry. In Apollonia’s earliest years, when the so-called Phoenicians ruled the coastal area, a small port city was founded. 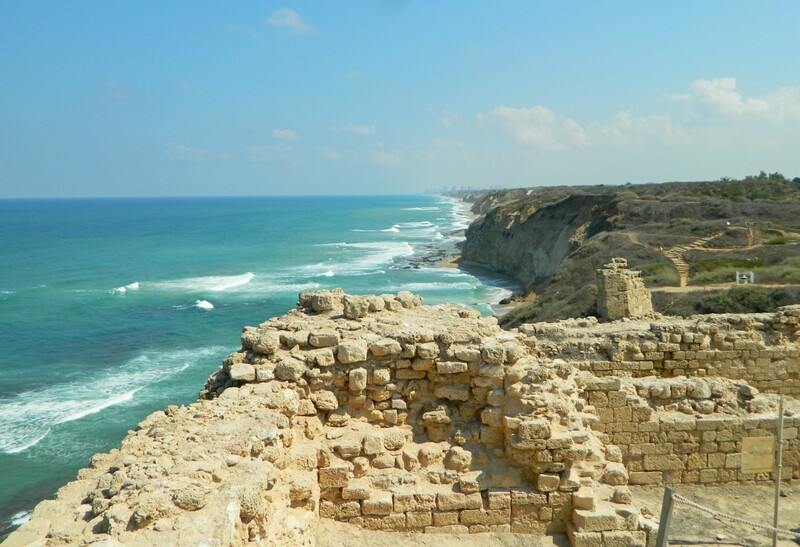 They called this city Arsuf after their god of war and storms, Reshef. When Hellenistic influence overrode the locals, the city’s name was changed to Apollonia, in honour of Apollo, the Greek equivalent of Reshef. The Roman times saw an enlargement of the city, with several different communities of inhabitants. During the Byzantine era the city became important, reaching its height of development and a sizable glass industry was created. We noticed lots of ancient glass bits littered about the path area towards the end of our visit, which brought us great excitement. 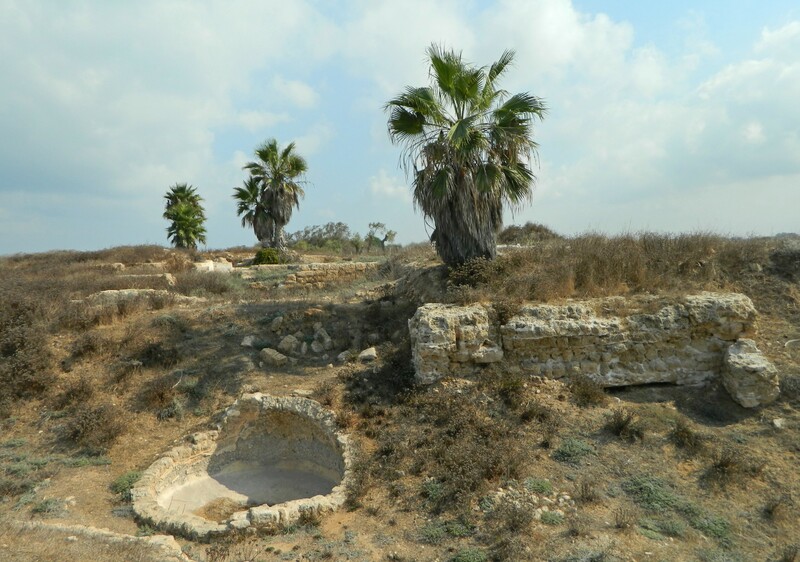 But it was the Crusader times and ruins that intrigue me most about Apollonia, when the site was renamed to Arsuf or Arsur by the Muslim and Christian forces, respectively. Thankfully there are ruins of this period still standing for us to see, the centerpiece of the park. I had read a lot about the battles that took place in and around Apollonia, as well as learned about modern techniques in research to verify theories with archaeological findings. 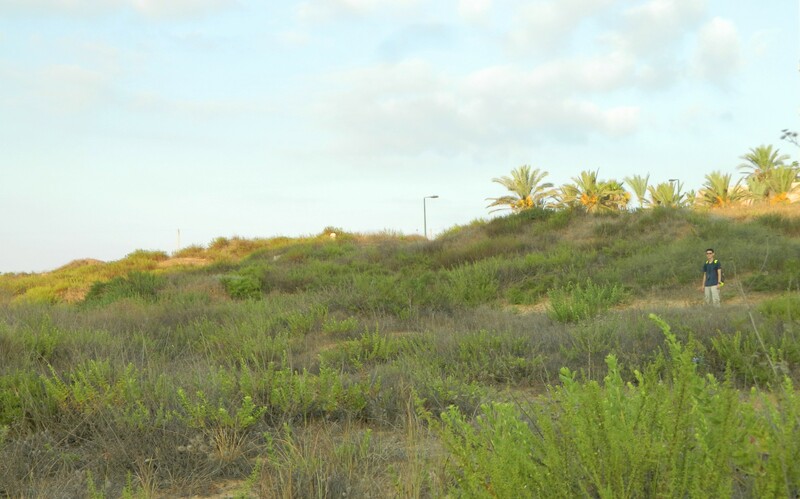 Dr Rafi Lewis of Haifa University explained to me one evening his process towards identifying the battleground location of the Battle of Arsuf between the Ayyubids under Saladin and the Franks under Richard the Lionheart, which was described as being partially fought at the edge of a forest. Unfortunately, the Ottomans cut down most of the trees in the Holy Land to fuel their impressive rail system, so the forest is no longer. However, a veritable line of medieval arrowheads was found and, using a clever method of using data gleamed from shooting recreated Ayyubid bows, the arrow flight distance was calculated. Measuring the length of the flight backwards from the arrow line gave an approximate location for the place where Ayyubid archers hid in ambush to cut down the Frankish troops. 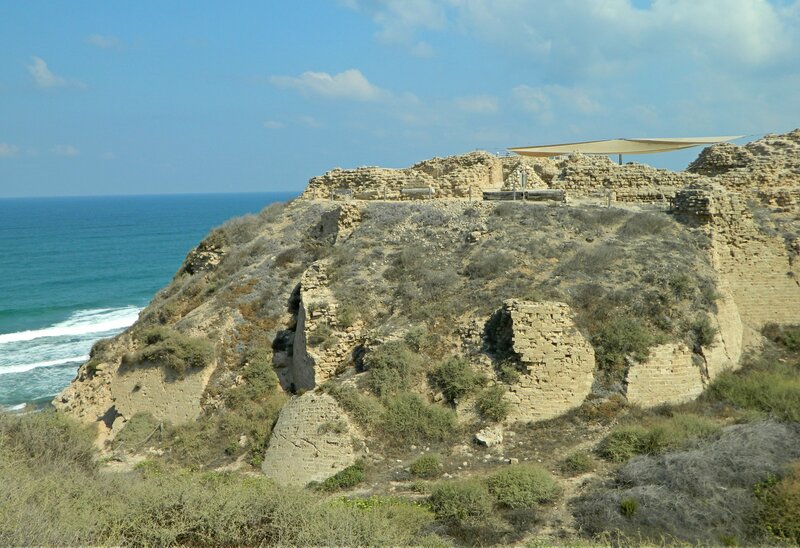 I found that to be absolutely fascinating and, since then, yearned for the day to visit Arsuf. Returning to our adventure, we entered the park and began along the paved path. 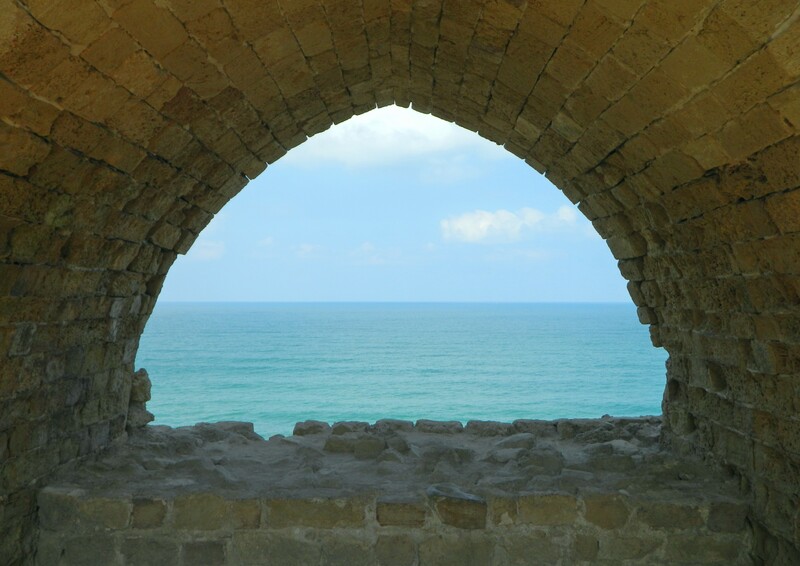 We gaze upon the southern moat and wall of the Crusader city and then the excavated remains of a Roman villa as we headed in the direction of the sea. The Mediterranean looked mighty fine that day, with a scattering of wispy white clouds in the rich blue sky. Walking along the sea cliff, parallel with the beach down below, we passed Byzantine water cisterns and reservoirs. We continued north until we reached the Ottoman lime kiln, a stone-lined furnace, and then swung inland a tad to walk around the Crusader moat. With moats come castles and this time was no exception. We gazed upon the stony ruins, imagining a time long since passed. 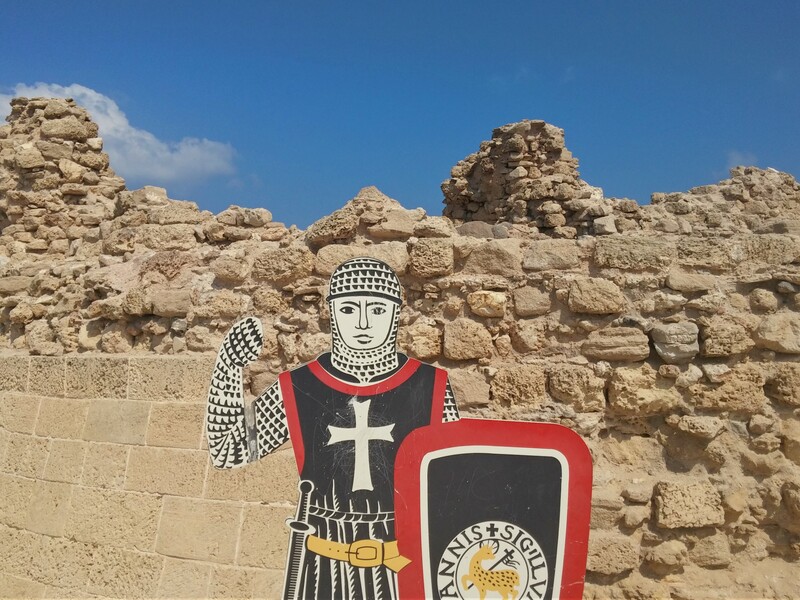 The castle at Apollonia was built in the mid 1200s after the city had been in and out of European rule since 1101 when it was conquered by King Baldwin I with Italian naval support. When the city was gifted to more private hands, those of a noble family, the castle was built. However, this was short-lived because the Mamluks were on their campaign from the south and, in efforts to save the region, Apollonia was given to the Hospitaller Order. But even the famous knights couldn’t stem the tide of Muslim conquest under the leadership of Baibars and the castle fell in 1265 after a forty-day siege. 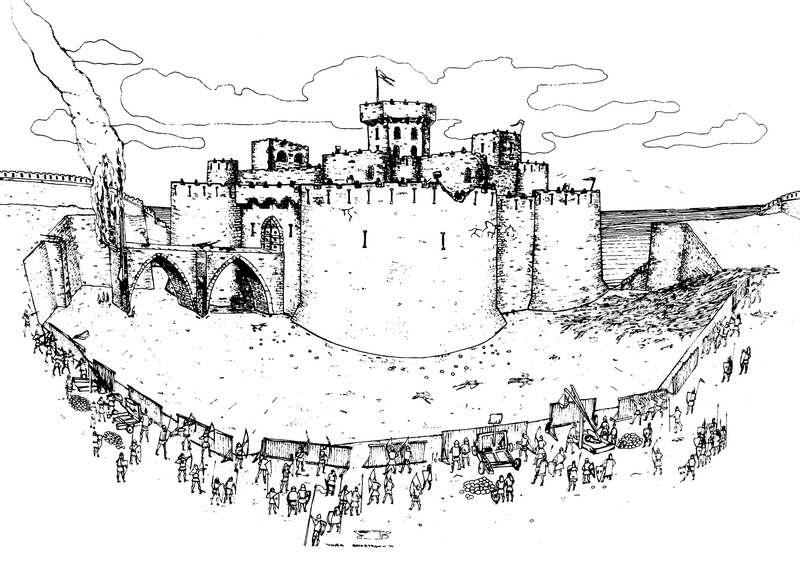 Since then, no locals or conquering forces have made attempts to rebuild the coastal fortress and so it stands today, a bastion of ruin surrounded by a deep dry moat. We then passed the site of the original bridge, long since fallen, and crossed via the “new” land bridge on the bright, paved path. A smartly dressed Crusader knight greeted us on approach, bidding us entrance to his home. Inside, we found ourselves in the courtyard of the fortress, surrounded by different rooms. We chose to visit the ground floor of the keep first, and to gaze out towards the sea from within the vaulted room. Continuing on in a clockwise manner, we visited the kitchen next, and then the dining hall and adjacent food-related chambres. 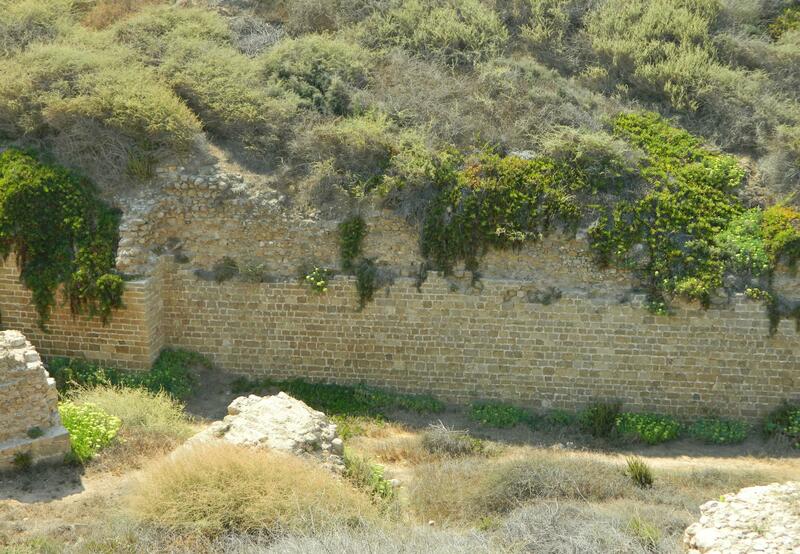 I noticed how small the dining room was, say, in comparison to the Crusader castles at Akko and Belvoir. Heading from the north end of the fortress’ interior to the south end, we entered the Burnt Room, named such after the visible burn marks from the Mamluk acts of destruction. Within the rooms at the south end we found many piles of ballista stones, which were used by the knights to counter the siege, as well as marble Corinthian column capitals. We climbed to the highest ruins of the keep and admired the view, looking down at the shore below to see the remains of the Crusader port. After some relaxation time in the shade we left the castle and made our way to the far northern end of the park. There we sat on a bench and talked about life’s complexities, losing a whole bunch of sandwich cookies to the sand below us. We watched the sea and its guests, and the military helicopter that flew over us. At last we took to the path once more and explored an unmarked excavation area with a simple mosaic floor. 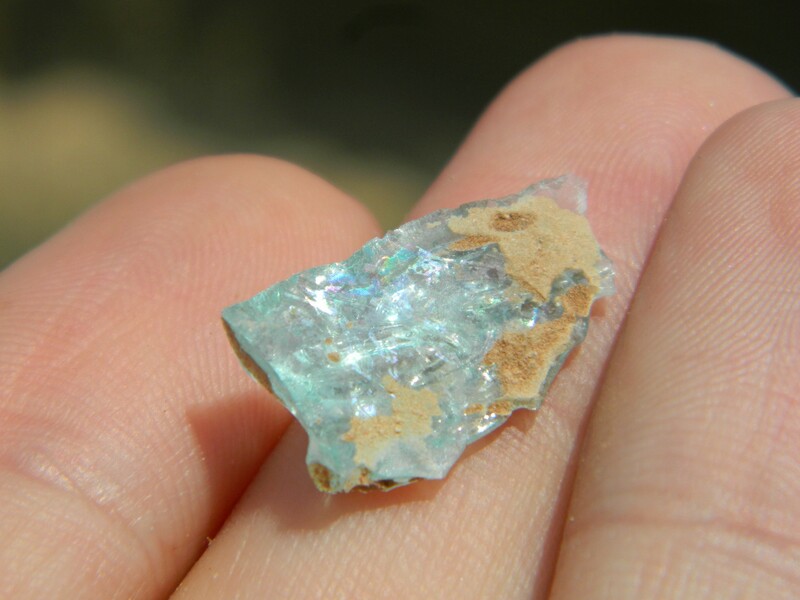 On and around the path we found tons of ancient glass shards, even the rim of a small bottle, as well as an adult antlion flying through the dry vegetation. With that we walked our way back to the park’s entrance and left, briefly exploring the high-tech area of Herzliya before parting ways, bringing an end to yet another successful trip. A special thank you to the talented Rebecca Zami who has been skilfully editing my blog for the last couple months!